Valentines Day is the sole occasion, specifically dedicated to lovers. This beautiful day provides you an excellent opportunity to express your hidden feelings towards your beloved. The origin of Valentine’s Day travels back to the 3rd century when a Christian priest, named Valentine sacrificed his life for the sake of religion and love. Every year, February 14 is celebrated as Valentine’s Day to honor the sacrifice of Saint Valentine. Moreover, love birds celebrate this special day as a day of romance. If your beloved resides in New Delhi and you are not able to meet him / her on this Valentine’s Day, then send exquisite Valentine’s Day presents online to New Delhi, through our delivery service, at cheap cost. A plethora of Valentine’s Day gifts is available on our virtual shopping store. Find the suitable one for your beloved and buy/order cheap Valentine’s Day gifts for India delivery online. 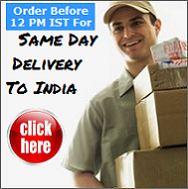 We’ll deliver your gift to New Delhi, timely. Apart from New Delhi, our online delivery service of Valentine’s Day gifts is available in Noida, Gurgaon, Manesar, Sahibabad, Greater Noida, Faridabad, Ghaziabad, and Agra. Sending Valentines Day gifts to New Delhi (India) is easy now! Buy/order and send Valentines Day gifts to New Delhi online with awesomeji.com and get free delivery.